This is one of four cover stories to appear in ESPN The Magazine's June 4 World Fame 100 Issue. Subscribe today! When Kevin Durant moved from Oklahoma City to the Bay Area, he didn't just do it to win a title -- he did it to reap the benefits of the technology investment capital of the world. 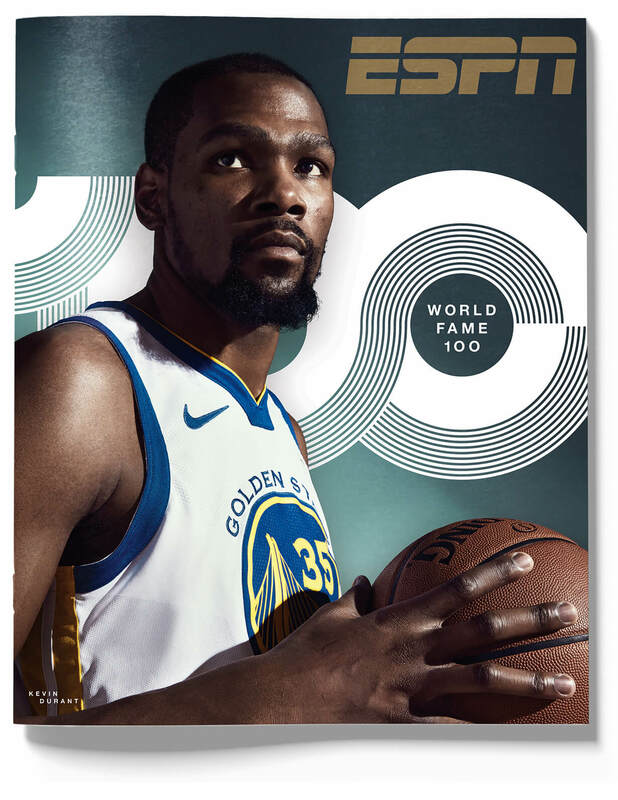 Less than two years later, Durant has gone from holding the most endorsements in the NBA (at one time more than 10) to owning one of the most wide-ranging investment portfolios in the league. Our third annual ranking of the biggest names in sports around the world is here. His roster is deep, and it speaks to his ambition to seek more than mere fame. His slimmed-down endorsement portfolio includes Nike, Alaska Airlines and American Family Insurance. Durant's Thirty Five Media not only produces his content on YouTube but also other original content for the platform. The company recently sold to Apple its first scripted series, called Swagger, loosely based on Durant's AAU days, and has two other projects in development with major TV networks. His investment arm, the Durant Company, claims early-stage investments from $250,000 to $1 million in roughly 30 companies through a network of venture capitalists, including online digital-currency platform Coinbase, spare-change app Acorns, cloud-computing startup Rubrik, drink company WTRMLN WTR, fast-casual pizza chain Pieology, bike-sharing company LimeBike and delivery company Postmates. • Can anyone besides the Warriors stop this dynasty? Clearly, Durant has been dropping dimes of the literal kind. So we sat down with him to discuss his presence in Silicon Valley, his growing empire and whether his ultimate investment might come in the form of an owner's suite. ESPN: How much smarter of a businessman are you than you were, say, two years ago? DURANT: I have mentors like Ron Conway [early-stage Google and PayPal investor] and Ben Horowitz [co-founder of Silicon Valley venture capital fund Andreessen Horowitz] and good friendships with guys like Chris Lyons [chief of staff for Andreessen Horowitz]. I mean, you just go to dinner with these guys, hang out with them. You start to meet these types of people at games. It's a little easier being here than saying, "Let's meet up when I come in from Oklahoma." How naturally does the business world come to you? You see the business of yourself first. You know what kind of image you want to portray, what stories you want to tell and how you want to use your resources to make everything grow. So I tried to look at the business of me first. Then I hired guys like [business partner] Rich [Kleiman], my financial guys, my foundation people that I've hired, just knowing that you can empower people to help push your vision. How do you best learn business? You have to remove the ego of it and realize that you don't know it all. I want to learn more about this life and this business and this world. So I've got to ask questions, and I've got to have an open mind to it all. Your brain kind of functions a little different as you get older. In the past, the locker room was a place to talk about investments, but often the investments that were "cool" were bad ones. What is the Warriors' locker room like with so many guys into investing? We don't talk about it every day, but you know what guys are doing. Andre [Iguodala] has been a tycoon throughout his life. Before I got here you were hearing about the stuff that Andre was doing, Harrison Barnes was doing. Andrew Bogut was looking into some stuff. And Steph [Curry] as well. I learned just being here that a lot of these guys just think about hitting singles, and if you focus on that, you'll eventually hit a big one. What's the craziest thing that you didn't know about investing? I used to think these billionaire venture capital firms got ahold of one company, invested in it and it blew up. I didn't know that they get 100 deals to look at in a day and pick the best nine or 10 to consider. That's a lot of work. That's an everyday process of vetting that out. You can't just skim through it. They figure out what the companies are, they talk to the CEOs, the coders. They have to really do their homework on it. You might be part of what was one of the biggest endorsement battles in the history of sports when, in the summer of 2014, you were a sneaker free agent. Nike ultimately beat out Under Armour with a 10-year, $300 million offer. What was that like? That process was just too much mentally because I love Nike so much. I knew I had a supreme skill that needed to be compensated for, and I knew I played my way into having these negotiations. But I didn't want to start over at Under Armour or Adidas. I knew where I wanted to be, and $300 million was more than enough. I'm now on my 11th Nike shoe. I know you have a lot of investments. I know some are structured differently from others. How does that work? Yes. The only thing we aren't doing is endorsement deals. There's nothing wrong with them, but time is the most important thing to me. And when you endorse a product, a lot of your time is taken away. But if you're proud of something about a company you've invested in, you can shout it out? Oh, most definitely. Even though I may not be there every day, I feel like I've left my imprint on things. So I'd rather do that than be an endorser of something, where I'm having to do commercials and photo shoots and go to events. I just want to believe in someone else, that they have a great idea, and try to back it as much as I can financially. And if they do need a little push from me, you know, I'm not saying I'm the biggest name in sports or in the entertainment business, but a lot of people follow me on social media and a lot of people know and watch basketball. You've said you'd like to own an NBA team. I wish I had the money. It's crazy. Obviously, the financial part is definitely going to be the hardest part. I've been part of two great organizations. I know the game inside and out and I know the players. And I feel like these NBA franchises just change lives. They change cities. I would love to do that. All the aspects of owning a team, I would love to be involved in -- from the financial and marketing side to the team-building to the camaraderie to the coaching. Best business advice you've been told? Don't do things just for money. Don't do things just for fame. Do things because you feel right and it feels true. That's interesting, because I feel like people say you're fake -- when you feel you're being real. Fake is what runs the world right now. Narratives are what matter. Perception is what matters. So when you've got the majority of the world worrying about perception and what they look like, then the people who don't care about that stuff seem fake to them.